When she was four years old, she decided that she wanted to start a lemonade stand to raise money to destroy cancer and give money to doctors to “help other kids like they helped me.” She did it with the hopes that she’d raise 1 million dollars. 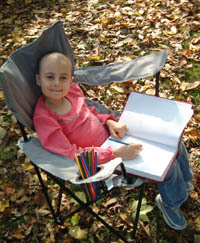 Sadly, Alex passed away when she was eight years old, but her family continued with her mission. Alex’s Lemonade Stand is a fantastic organization that raises money and builds awareness for all types of childhood cancer. I turned 33 yesterday, an age that I wasn’t sure I’d hit when I was diagnosed with cancer. I’ve been in remission for three years and I feel great, except that others have to struggle way worse than I did. Before I was diagnosed, I raised money for childhood cancer by “auctioning off” space on my body for a tattoo. Not any tattoo, though, it was a Twitter handle for whomever donated the most. The high bid and donation was $2,112 and it was a success, and of course I got the tattoo. You can read all about it here if you like. For Alex, and for children everywhere battling cancer, I’m doing it again. This time, the money goes right to Alex’s Lemonade Stand. Even if you don’t want to hop into a battle for real-estate on my body in tattoo form, every little bit counts. Let’s all chip in and doing something great, and I’ll end up with the most special tattoo ever. I hate cancer, and I’m sure you do, too. Everyone has been affected by it in some way. Am I crazy? Maybe, but YOLO. Maybe I’ll even outbid everyone and get my own Twitter name tattooed on myself. Now that’s meta. Or maybe it could be you. It runs until November 14th. You made it, Alex. Thank you. UPDATE: Andrew Gazdecki has donated $2,000 (in honor of both of his parents, who are survivors). Let’s keep going! UPDATE 2: The world lost a very special person on 11/11/12 at 17 months old. Her name is Elena, read more here. This is for her and her family, too. UPDATE 3: A “Matt” has donated $4,000. Which is absolutely amazing. Only problem is I don’t know which “Matt” it is. Step forward, please, kind sir.